Brought to you by Telford & Wrekin Council, The University of Wolverhampton, The British Army and Shropshire Star and Express & Star and the Careers and Enterprise Company. The Apprenticeship Show 2019 returns to The International Centre, Telford on Thursday 7th March from 12pm to 7.30pm for the 4th consecutive year. 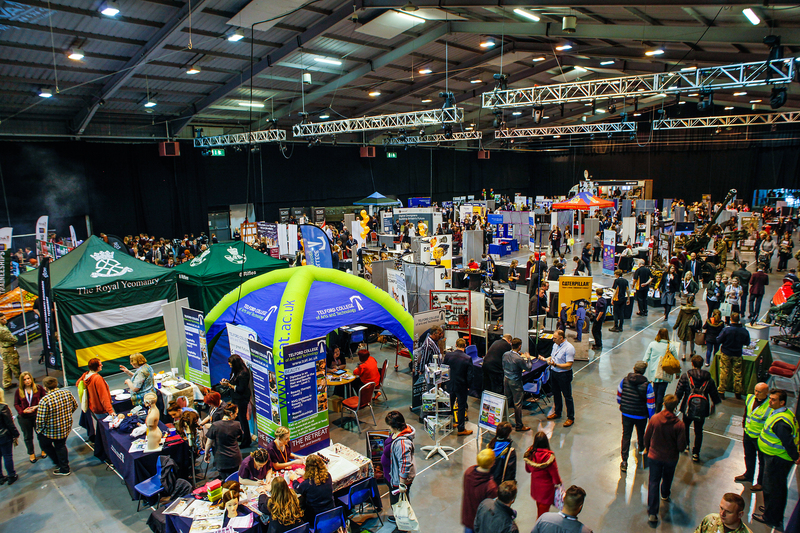 In 2018 we welcomed over 3,700 visitors and 70+ exhibitors including employers, universities, colleges, training providers and advice and support organisations. The show is the largest of its kind in the area and offers visitors a fantastic opportunity to find out more about the wide range of careers now available through Apprenticeships, the local companies that are offering the positions and the training providers that will be supporting the training. There will be opportunities to "have a go" at tasks and activities that employers and training providers are offering roles in. You will be able to speak to people who are doing the jobs now, and get all the help and support you need to make that all important decision about your first career or even a change in career. Come along with your school, college, family or friends and get involved in the regions biggest and best apprenticeship event. With hands-on and interactive activities you will discover new careers, skills and jobs that are all offered through apprenticeships. Schools and colleges download the booking form. Big groups need to pre-book and individual visitors can pre-book to avoid cues or come along any time. Visit The International Centre website for directions. Click here to see our up to date list of exhibitors. Please check back regularly for further updates. As an exhibitor you will join top employers, training providers and support organisation from across the region in meeting thousands of young people, their teachers and their families. This is your opportunity to promote your organisation to the regions future workforce. Download the training provider booking form or business booking form. We are inviting 5 leading organisations to support and influence the continued growth and expansion of The Apprenticeship show for the 3500+ visitors that attend every year. Download the sponsor package information, for further details please email kim.hodgetts@telford.gov.uk.